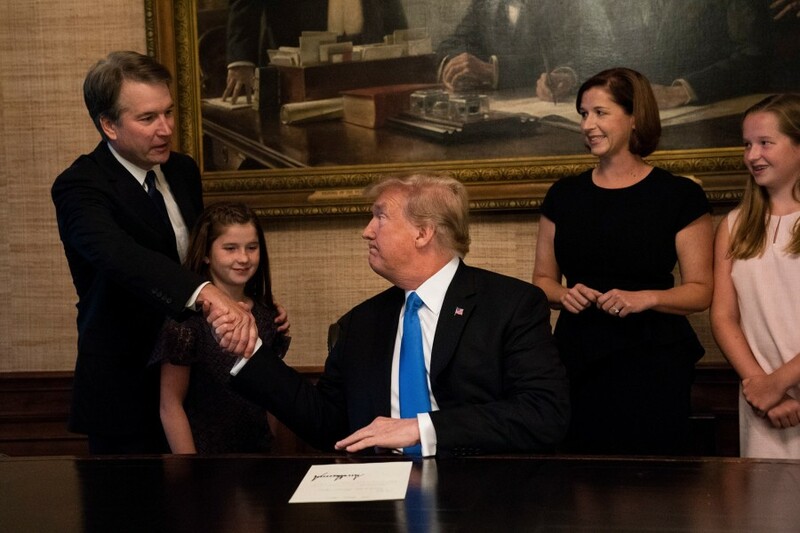 President Donald Trump with Judge Brett Kavanaugh, his nominee for the Supreme Court, and Kavanaugh's wife, Ashley, and their daughters in the residence of the White House in Washington, July 9, 2018. WASHINGTON — Most Supreme Court appointments are in a way inconsequential. A conservative replaces a conservative, a liberal replaces a liberal, and the court’s basic direction is unchanged. That is not the case with the nomination of Judge Brett Kavanaugh, whose Senate confirmation hearings will begin Tuesday. Kavanaugh is considerably more conservative than the justice he would replace, Anthony Kennedy. But there is another reason that President Donald Trump’s pick of Kavanaugh could remake the court. His confirmation would result in a rare replacement of the court’s swing justice, moving Chief Justice John Roberts to the court’s ideological center. If Roberts assumes that position, legal scholars said, he will lead a solid five-member conservative majority that would most likely restrict access to abortion, limit the use of race-conscious decisions in areas like college admissions, uphold voting restrictions, expand gun rights, strike down campaign finance regulations and give religion a greater role in public life. “John Roberts would be the least swinging swing justice in the post-World War II era,” said Justin Driver, a law professor at the University of Chicago. That would be a major break from the role that Kennedy played for years on the court. Kennedy at times voted with the court’s four-member liberal wing on issues like abortion, affirmative action, gay rights and the death penalty. Kennedy and Roberts were on the opposite sides of 51 closely divided decisions in which Kennedy joined the court’s liberals, according to data collected by Lee Epstein and Andrew D. Martin of Washington University in St. Louis and Kevin Quinn of the University of Michigan. Republicans are confident that they can quickly confirm Kavanaugh. Erwin Chemerinsky, the dean of the law school at the University of California, Berkeley, said there was a way to determine where the Supreme Court would head if that happens.